This review is based on an ARC given to me for free by the publisher, Angry Robot Books. This does not in any way affect my review. This book is slated for release on June 5, 2018. I’ve loved chocolate since I had my first taste of it when I was a little girl. It was a piece broken off of a Nestle Crunch candy bar, handed to me by one of my parents, though I don’t remember which. That first taste created a love for chocolate that lasts to this day (though nowadays I eat more dark chocolate than milk chocolate, due both to changing tastes and health reasons). Indeed, there is no flavour quite like chocolate – and I and many chocoholics both in the past and in the future will agree that chocolate is one of the most sublime foodstuffs ever discovered. The sublimity of chocolate was first discovered by the Mesoamericans, who first started harvesting and then cultivating the cacao plant for use in rituals and medicine – and later, when the Aztecs came to power, as currency. When the Spanish conquered Central America they brought chocolate over to Europe, where it became a popular foodstuff; as a result, plantations were set up all across the world, most of them in colonies falling within a narrow band of twenty degrees north and south of the equator. Most of the world’s chocolate now comes from countries that fall in that band: the Ivory Coast and Ghana are the leaders of production, with Indonesia, Cameroon, and Nigeria close at their heels. The Philippines is a very small producer, comparatively speaking, but the quality of the chocolate produced is exceptional, if the results from the 2017 Academy of Chocolate Awards are any indication. However, chocolate is not without its troubles. For instance, climate change is quickly making it more difficult to grow chocolate within its usual geographic range, and though alarmist claims that cacao will go extinct in forty years are exaggerated, what may happen is that chocolate may become more and more expensive in the coming years and stop being as ubiquitous as it has become in contemporary times. Chocolate production is also fraught with political complications, not least of which is child labour and child slavery on African plantations, which sell most of their product to big Western corporations like Hershey’s and Cadbury. In the future, as demand for chocolate grows and climate change shrinks yields (both in terms of quality and quantity), there may come a time when chocolate will become a flashpoint for metaphorical, and perhaps literal, violence. In the novel Free Chocolate, Amber Royer posits a future where the latter scenario is an all-too-real possibility. In this version of the future, Earth is the only exporter and producer of chocolate: what is probably the most valuable commodity in the entire galaxy because it is in such high demand. In order to maintain control of chocolate Earth has all but closed itself off from the rest of the galaxy: no one except humans may come and go from Earth, and taking viable cacao off-planet is a crime punishable with death. This has been the reality of Bo Benitez’ world for as long as she can remember. Bo’s life has been dominated by chocolate, and not only because she’s a culinary arts student: her father died in a fire at one of the chocolate plantations, and her mother is a celebrity chef sponsored by the giant chocolate conglomerate that monopolises Earth’s chocolate industry – and, therefore, the galaxy’s chocolate industry. However, Bo does not think that Earth’s chokehold on chocolate is right. In order to break that chokehold, Bo decides on a daring, and utterly insane, plan: to sneak into one of the cacao plantations on Earth, and steal a viable cacao pod to sell to an alien. However, things do not go as planned, and Bo is forced to go on the run, caught between an alien police officer who will stop at nothing to capture her, and an even more sinister person back on Earth, who will do anything – even hold her entire family hostage – to make sure chocolate remains in Earth’s grip. One of the first things the reader will notice about this novel is the language. Told from the first-person perspective with Bo as the narrator, it incorporates a lot of Spanish, along with a smattering of alien languages. Now, while I am not at all opposed to incorporating a non-English language (made-up or otherwise) into a narrative that’s otherwise primarily in English, I do expect that those language/s are used sensibly. There is an internal sensibility to code-switching, one that is embedded in a working knowledge of not just the vocabulary but also the grammar of both languages. Bilingual speakers know, on an instinctual level, where in a statement to switch between languages, when and how to alter tenses and forms and so on, so that the statement comes off as “natural”. It was that “second sense” that made me a little twitchy when I started reading this novel. There was just something about the way the narrative switched between English and Spanish that scratched my brain in the weirdest ways. Given Bo’s Latina background, I was expecting the code-switching to be a bit more natural; after all, it was likely she grew up in a household where Spanish and English were spoken interchangeably, and so the code-switching ought to be more natural. But given the rather awkward nature of the code-switching itself, it made me wonder about the author’s background. Was the author raised bilingual? That did not seem likely; instead, it seemed as if the author was monolingual, and then picked up Spanish as a second language later on in life, instead of growing up in a household where both languages were used. I realised, of course, that I could be biased. I did not grow up speaking Spanish either, after all, nor did I grow up hearing it used. To be sure, Filipino has a lot of Spanish loanwords (no thanks to my country being a Spanish colony for three hundred years), but that is obviously no substitute for actual knowledge of the language. So I did the next best thing: consult with a friend who is actually bilingual in Spanish and English (having grown up in Cuba before moving to Canada). After some back-and-forth over Messenger, with me passing said friend some selected phrases from the novel and asking: “Does this sound natural to you?”, I got the information I needed. Apparently, on the technical, grammatical level, the code-switching is correct, but the little details like word choice and preposition and article use have been fudged a little bit. It’s not anything totally egregious, but it would explain why it does not seem to “flow” as naturally as it should. My friend also got the sense that the Spanish was “superimposed” over the English, which again would make sense if the author’s first language really is English and Spanish is the second language. It was those little details, my friend said, that were probably the reason why the code-switching didn’t seem to flow right, since the Spanish was not playing quite as well with the English in the way a truly bilingual speaker of Spanish and English would make them. At the end of it all, though, the true verdict on the matter lies not with me, but with actual Latino readers – especially those of Mexican descent – who will pick this book up and see for themselves whether or not Bo’s code-switching is up to snuff. It will be interesting to see their take on this, once the novel comes out. Another issue that I have with this novel has to do with how it handles certain themes that could have added great weight to the story as a whole. Now, I understand that this book is meant to be a light-hearted romp with touches of romance, and there is absolutely nothing wrong with that, but there was so much potential for addressing various important issues here that were mentioned in passing, but were not dealt with at any great depth. For example: throughout the novel, Bo mentions the oppression that chocolate growers suffered in the wake of three companies – Hershey’s, Godiva, and Bissinger – coming together to form one conglomerate called HGB, which controls all of the chocolate on Earth, and therefore, by extension, everything on and related to Earth too, from technology to interplanetary politics. Passing mention is made of a period in Earth’s history when chaos reigned: cacao shareholders being murdered, entire communities being sprayed with poison. These details are mentioned so quickly and so briefly that it can be easy to miss them, given the novel’s breakneck narrative pace, but those details stuck with me because I thought they were interesting – not least because they seemed to be the key to several mysteries that are, again, mentioned throughout the novel but aren’t fully explained. I suppose that lack of depth and detail is to be expected, since apparently this novel is meant to be the first in a series, but I still find myself wishing that there had been a bit more emphasis on those themes – not least because these are issues that actually are happening in the real world today. As human populations grow and climate change alters entire ecologies, the demand on various natural resources – chocolate among them – will steadily climb and reach breaking point. The most frequently mentioned are the impending water wars, but even in the context of chocolate these dangerous changes are already happening; as I have mentioned earlier, the plantations in Ghana and the Ivory Coast are already being investigated for using child labour. Is it coincidence that these same plantations are the ones that supply the biggest candy companies in the West? Perhaps: after all, giant corporations like Hershey’s either do not see – or do not care to see – the kind of oppression and hardship they create in their wake, the lives that are lost, so long as they profit. This is why it’s mildly disappointing that this novel doesn’t really go as in-depth into the issues created by HGB. Again, I understand that there will be more in the coming novels, but truth be told, I’d be happy to sacrifice some of the romantic interludes in this novel if it meant that there’d be more focus on those darker threads. But then again, the lack of focus on those major issues does make a certain kind of sense, given who is telling this story. Bo is not an activist, after all, though she does have her own cause that she wishes to fight for. By the end of the novel, though, it’s quite clear that she now has a focus to aim for, one that does tie into the issues I’ve just mentioned, so I have rather high hopes that those will be put into clearer focus in the sequel. Speaking of Bo, she is actually quite fun to read about, though I do find her a bit lacking in focus from time to time. Not that I can blame her: given all the things that happen to her at the same time, it would be terribly easy to lose track of what is happening at any given point in time. This confusion extends to the narrative, which, as I have mentioned earlier, does go at a rather breakneck speed and can be confusing at times for the reader to follow along. Again: it’s a perfect mirror of Bo’s situation and what kind of space she’s in in her head, but I hope the author gets a better handle of the narrative in later books. 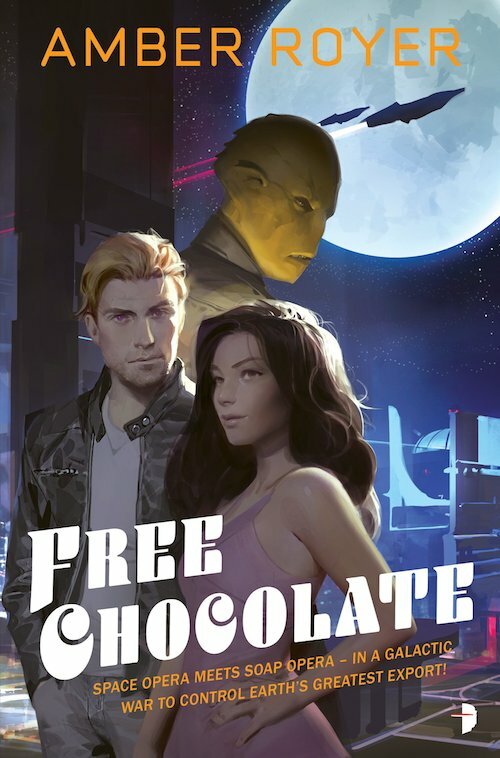 Overall, Free Chocolate is a fun, mile-a-minute read that goes by quickly and easily, mixing action and romance in equal and entertaining measure. However, it is not without its problems: namely, potential issues with the way Spanish and English are used, and the rather shallow treatment of some very interesting ideas that are connected to actual, real-world problems. There is also the issue of pace, which may whizz by a little too fast for the taste of certain readers. Putting those aside, though, the novel does show a great deal of potential, and I will be keeping an eye out for the sequel, which will hopefully be an improvement on this one.